sum up: You've seen Wedgwood Broiler before...even if you've never stepped inside. More than a restaurant, this is a snapshot of middle America, a time warp to the 60's, a simple slice of nostalgia. Here, the prices are right, the menu features ol' standbys like Shrimp Louie and Chicken Fried Steak, and the waitresses are uniformed in polyester. Familiar tastes so good. 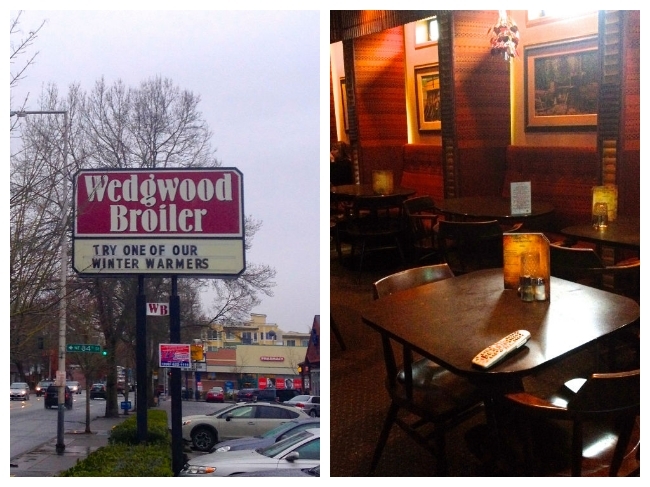 ambiance: Marooned out in middle-class suburbia, the Wedgwood Broiler draws a mix of regulars and neighborhood folk. Without the trappings of urban swagger--the bartender sports a Christmas sweater proudly, not in the ironic, hipster way--inside feels like Anywhere, U.S.A. The only clue we're in Seattle are the Seahawks hats scattered a top the clientele. Take a break from the mixology madness with classic cocktails. Whether you take your martinis up or dirty on the rocks, the drinks are good n' cheap. When my friend and dinner date, Cat, told me about Wedgwood's signature salad, I had to taste it for myself. This chef salad of snack foods--yup, those are Cheez-its and salami--is improbably delightful, especially with honey mustard dressing. The tasty "by the ounce" steaks are a specialty of the house. They're a steal, too, at just $22 for a 12 oz. with all the fixings. When I asked for mustard to accompany my perfectly-cooked meat, the bartender joked, "What, are you French or something?" A testament to how far from highfalutin the Broiler is. One of my all-time-faves, Chicken Fried Steak, is as good as ever here. I mean, what's not to love about a breaded and fried Salisbury steak slathered in gravy? Calorie counters need not answer. Each dinner comes with the tried and true combo of soup or salad, choice of potato and veg. 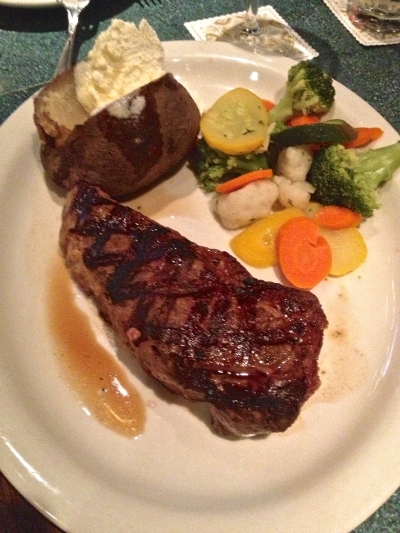 Opt for the baked potato, which comes with enough self-serve fixins' to fill your spud to the max.